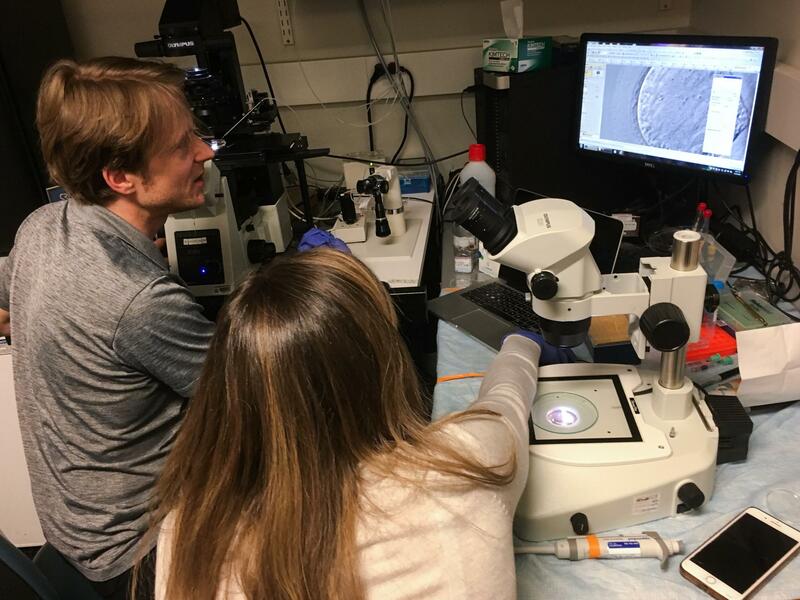 Dieter Egli, a developmental biologist at Columbia University, and Katherine Palmerola examine a newly fertilized egg injected with a CRISPR editing tool. "Right now we are not trying to make babies. None of these cells will go into the womb of a person," he says. Egli hopes doctors will someday be able edit embryonic human DNA to prevent many congenital illnesses, such as Tay-Sachs disease, cystic fibrosis and Huntington's disease. "Preventing inherited forms of blindness would be wonderful — very important for affected families," Egli says. "This is really disturbing," says Fyodor Urnov, associate director of the Altius Institute for Biomedical Sciences in Seattle. He worries such experiments could encourage more irresponsible scientists to misuse gene-editing technologies. Egli's research is reviewed in advance and overseen by a panel of other scientists and bioethicists at Columbia. While the debate over research like Egli's continues, the U.S. National Academies of Science, Engineering and Medicine, the World Health Organization and others are trying to develop detailed standards for how scientists should safely and ethically edit human embryos. "We can't just do the editing and then hope everything goes right and implant that into a womb. That's not responsible," Egli says. "We have to first do the basic research studies to see what happens. That's what we're doing here." To show NPR what he is doing, early one morning Egli pushes open the door of a tiny windowless room on the sixth floor of one of Columbia's research towers in Upper Manhattan. The lab is jammed with scientific equipment, including two microscopes. "I'm going to wear gloves because we want to keep things clean," he tells me. "I'm starting with just one egg," he says as he gently places the first thawed egg into the dish. "It's a beautiful cell," Egli says, pointing to a magnified image of the egg on a computer monitor. "I would say it's one of the most beautiful cells." Egli maneuvers a tiny glass needle protruding into the side of the microscope dish toward one of the sperm. "So you can see a moving sperm over here," he says. "Now I'm picking it up. The sperm is in the needle. Now I'm dipping it in the CRISPR tool." 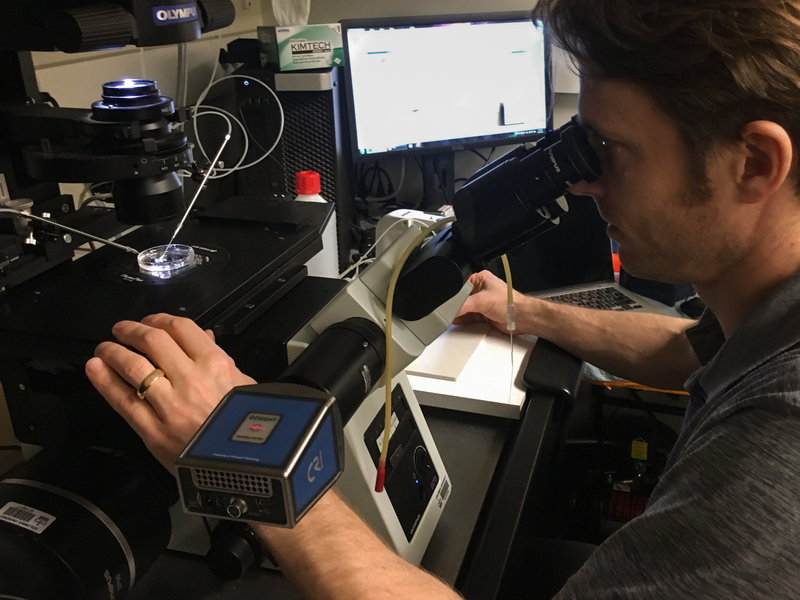 Once the sperm is inside the needle with the CRISPR gene-editing tool, Egli points the needle's tip at the egg. "Oh no!" he exclaims with a sigh. "The sperm is swimming away." "Oh, here it is," he says as he pulls the sperm back into the needle. Next, Egli gently pierces the egg with the needle. "The membrane is broken — breached. There we go," Egli says as he injects the sperm and CRISPR tool into the egg. He breathes a sigh of relief. "Hopefully the CRISPR tool will cut the mutation and then the egg will replace that with a version that no longer causes disease," Egli says. "The genome from the mother would be rescuing the mutant genome from the father." 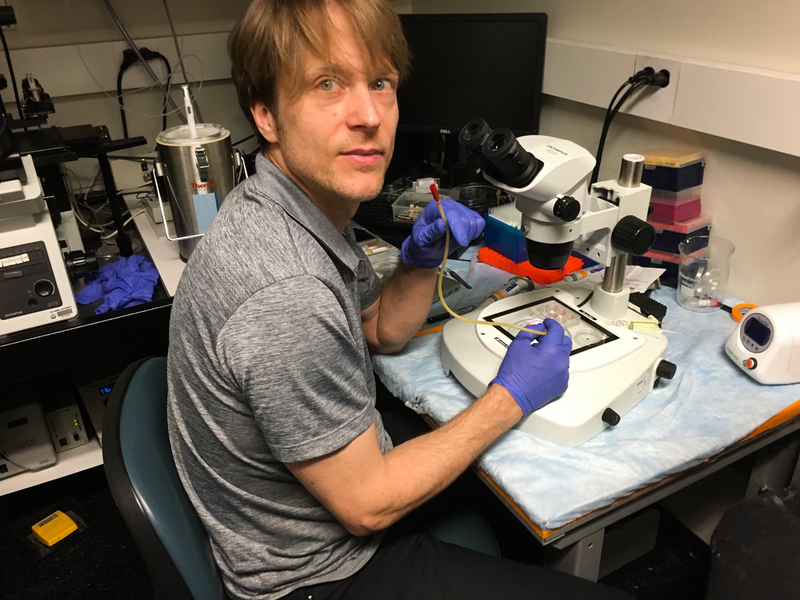 Egli was initially skeptical of the Oregon group's claims that they had used CRISPR for the first time to repair a mutation in human embryos this way. Egli's research is aimed at trying to confirm that it works and how. Mitalipov's group is also continuing to study the technique to see whether it can safely fix several genetic mutations in human embryos, including one of the breast cancer genes. "There we go," he says later, after the needle is replaced. "That one definitely worked. Beautiful." "If we've learned anything from what's happened in China, it's that the urge to race ahead pushes science to shoot first and ask questions later," says J. Benjamin Hurlbut, an associate professor of biology and society at Arizona State University. "But this is a domain where we should be asking questions first. And maybe never shooting. What's the rush?" That's especially true when the prospect of creating gene-edited babies raises so many fraught ethical questions, including fears that it could eventually lead to the creation of "designer babies," critics say. "We don't need to be mucking around with the genes of future children," says Marcy Darnovsky, director of the Center for Genetics and Society, a watchdog group. "This could open the door to a world where people who were born genetically modified are thought to be superior to others, and we would have a society of people who are considered to be genetic haves and genetic have-nots." "This is valid research, and I think it's important research," says R. Alta Charo, a bioethicist at the University of Wisconsin, Madison. "It has value not only for the possible use in the future for some number of conditions that would involve a live birth, but it has value for basic understanding of embryology, basic understanding of development," Charo says. "Of course I think we should be doing that research. Why wouldn't you be doing that research?" "Is there value in doing that kind of research? I think there is," agrees Jennifer Doudna, a biochemist at the University of California, Berkeley, who helped invent CRISPR. "Does it have to be carried out carefully and under the right regulatory guidelines? Of course. But I think there's value in doing research like that." "I'd like to see the U.S. be involved and show leadership on how to do that responsibly rather than say we're not going to have a seat at the table," Doudna says. Back in Egli's lab, it's now nearly 3 p.m., and he is wrapping up the day's experiments. "OK, that's it. That's the last one," he says as he places back into storage the last of 14 eggs he managed to fertilize and hopefully edit. He will stop their development the next morning to see whether it worked. A Chinese scientist stunned the world last year when he announced that he had created the first gene-edited babies. Now NPR has learned about a new experiment aimed at creating gene-edited human embryos. It's being conducted by a scientist in the United States. Let's be clear. He is not trying to make genetically modified babies yet, but that could be the ultimate goal. NPR health correspondent Rob Stein brings us this exclusive story from inside the scientist's lab. ROB STEIN, BYLINE: It's early in the morning at one of Columbia University's research towers in New York City. I meet Dieter Egli in his office on the sixth floor. Hi, Rob Stein from NPR. DIETER EGLI: (Laughter) You came in with a microphone. EGLI: I guess that's your job. That's what you do. STEIN: Yeah, we have to kind of record every little thing for our stories. Egli leads me down the hall to a tiny windowless room. It's jammed with scientific equipment - two microscopes, lab dishes. He's going to show me how he's trying to fix mutations in human embryos. EGLI: I'm going to wear gloves because we want to keep things clean. STEIN: Egli wants to know if it's really possible to use the revolutionary gene-editing technique known as CRISPR to safely repair genes in human embryos. STEIN: Egli is trying to repair a genetic defect that causes blindness to maybe, someday, help blind people carrying the mutation have children who can see. EGLI: Preventing inherited forms of blindness would be wonderful and very important for affected families. STEIN: One big reason the world condemned the Chinese scientist is he rushed ahead without doing enough careful research first to prove it works and is safe. EGLI: We can't just do the editing and then hope everything goes right and implant that into a womb. That's not responsible. We have to first do the basic research to see what happens. That's what we are doing here. STEIN: But even just doing the basic research to see if this might be possible is really controversial, but more about that later. Right now, Egli is ready to start his editing experiment. He turns to a big, black microscope behind him and slides a round glass dish under the lens. That dish contains the CRISPR gene-editing tool, along with sperm from a blind man who carries the defect that Egli is trying to fix. Egli gently adds a human egg to the dish. EGLI: I'm starting with just one egg. You'll be able to see it shortly once I go to higher magnification. STEIN: I can see everything he's doing under the microscope magnified on a computer monitor. The big round thing is the egg. It looks like the moon. EGLI: Yeah, it's a beautiful cell. I would say it's one of the most beautiful cells. STEIN: Egli maneuvers a tiny glass needle towards one of the sperm. EGLI: So you can see I'm moving sperm over here. I'm picking it up. The sperm is in the needle. Now I'm dipping it in the CRISPR tool. STEIN: Once the sperm is inside the needle with the CRISPR gene-editing tool, Egli points the needle's tip at the egg. EGLI: Oh, no. No. The sperm is swimming away. Oh, here it is. STEIN: Once that runaway sperm is back in the needle, Egli pierces the egg. EGLI: The membrane is broken, breached. There we go. Sperm and CRISPR tool in the egg. STEIN: Oh, you did it. STEIN: The idea is that CRISPR will slice out the mutation in the sperm, and the healthy DNA in the egg will fix it. EGLI: Hopefully the CRISPR tool will cut the mutation, and then the egg will replace that with a version that no longer causes disease. The genome from the mother would be rescuing the mutant genome from the father. STEIN: Scientists in Oregon who developed this approach are also trying to prove the technique can safely fix genetic mutations in human embryos, including one of the breast cancer genes. STEIN: For the next two hours, Egli painstakingly fertilizes and edits one egg after another. EGLI: There we go. That one definitely worked - beautiful. STEIN: It may be beautiful to Egli, but this kind of research is making some people very nervous. FYODOR URNOV: This is really disturbing. STEIN: Fyodor Urnov is a scientist at the Altius Institute for Biomedical Sciences in Seattle. He worries this kind of research will encourage more scientists to go rogue and misuse this technology. URNOV: As we've learned from the events in China, it is no longer a hypothetical that somebody will just go ahead and go rogue and do something dangerous, reckless, unethical. Anyone with a connection to the Internet will be able to download the recipe to make a designer baby. And then the question becomes, what's to prevent them from using it? And as we learned in the past year, apparently nothing. STEIN: So Urnov wants a halt to such research until scientists can figure out how to prevent more abuse. URNOV: We need to hit the pause button and keep it pressed until we understand how do we proceed in a way that minimizes the risk of people going rogue. STEIN: And society has had a chance for a broad debate about whether there's really any good reason to ever try to make anymore gene-edited babies when there are so many other ways to prevent genetic diseases. But many others disagree. ALTA CHARO: This is valid research, and I think it's important research. STEIN: Alta Charo is a bioethicist at the University of Wisconsin. CHARO: It has value not only for the possible use in the future for some number of conditions that would involve a live birth, but it has value for basic understanding of embryology, basic understanding of human development. Of course I think you should be doing that research. Why wouldn't you do that research? EGLI: OK, that's it. That's the last one. STEIN: Fourteen fertilized and edited eggs are safely back in storage. Wow, so that was a lot of work. EGLI: Yeah, well, that - it was. STEIN: Egli stresses he's nowhere near trying to make any gene-edited babies this way. He stops his embryos from developing right away to study them. EGLI: Right now we're not trying to make babies. We are working with human embryos for research purposes only. None of these cells will go into the womb of a person. STEIN: What if it does work safely, Egli says? This gene editing could someday prevent a long list of horrible diseases - Tay-Sachs, cystic fibrosis, Huntington's; not make designer babies. EGLI: If we ultimately find ways to prevent diseases, that will be wonderful. STEIN: While this debate rages, the National Academies of Science and Medicine, the World Health Organization and others are trying to come up with tougher guidelines for how scientists could safely and ethically edit human embryos. Rob Stein, NPR News, New York.